Fill your Church with the fragrance of spirituality with one of our beautifully detailed Orthodox Church censers for sale. Functional and ornamental, they are great additions to various liturgical services conducted within the House of God. In Orthodox Christian theology, burning incense is symbolic of prayers rising to reach God in the Kingdom of Heaven. Censer is the metallic vessel with a container (censer insert) wherein live coal is placed. When a clergyman is ready for censing, incense particles are thrown on the live coal which immediately sends up a cloud of smoke and fragrance. Istok Church Supplies is proud to present an exclusive range of exquisite incense supplies including hanging censers, hand censers, censer inserts, charcoal holders in various shapes, censers for bishops, censer stands and much more. 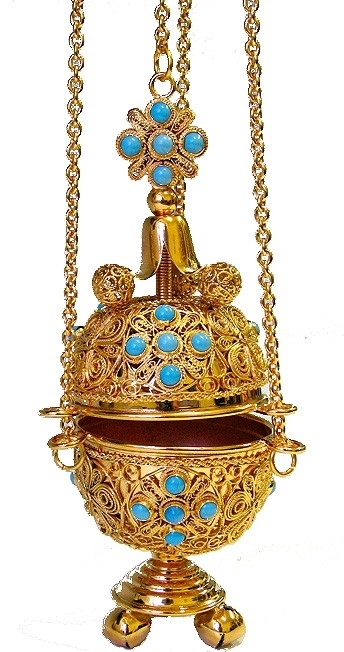 We offer Orthodox Church incense burners in two broad designs – hanging and hand held. The hanging sets follow the legacy of ancient orthodox Christian traditions and include chains for support. Some of the hand censers are accompanied by a wooden handle of suitable length to protect the user from hurting himself. All our products in this category feature have spokes in the dome that allow smoke to escape and keep the coals alive. 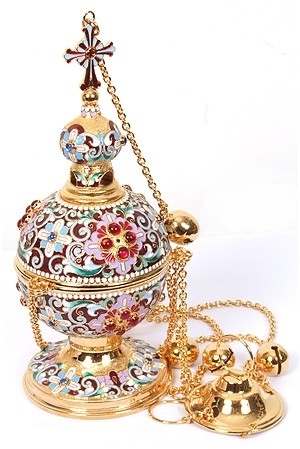 Incense burners we offer are made of brass or German silver and are sometimes accompanied by lavish decorations in the form of gold gilding, jewels and enamel work. Take a look at our stunning Byzantine censer and you’ll immediately fall in love with it – it’s that gorgeous! In addition to incense burners for Orthodox Church, we offer a host of related products such as censer inserts which need to be replaced from time. Think back and try to remember your earliest memories of being in an Orthodox Church – chances are you’ll remember the sweet aroma of incense wafting through the air. It’s time for new generations to experience the magic of spirituality. Order one of our excellent incense supplies and make it happen!